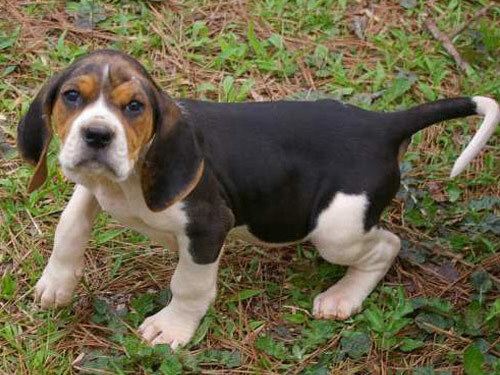 Built for power and speed the Treeing Walker Coonhound has an over abundance of endurance and stamina. Their long ears and square muzzle give this breed a somewhat similar appearance to a Basset Hound. They are extremely agile and elegant in movement. This breed is a free spirit who thrives outdoors in any climate. The Treeing Walker Coonhound is highly skilled, intelligent, and courageous. First and foremost they are hunting and working dogs, and yet, they also make a terrific companion. They thrive on attention, are loving, and eager to please. They get along well with older children and other dogs. However, their instinct to hunt small or moving prey does not make them suitable for homes with cats or other small household pets. The Treeing Walker Coonhound is typically high-strung and exuberant. They do not do well if left alone for extended periods of time. Without attention and stimulation they will become bored and destructive. This breed requires minimal grooming and only needs to be combed and brushed occasionally. Bathing should only be done when necessary. It is important to keep their ears cleaned and checked regularly for any sign of infection. The Treeing Walker Coonhound is a relatively healthy breed. With their keen sense of smell and strong hunting instinct this breed will track with total abandon. This will often lead them into perilous danger. The Treeing Walker Coonhound has a short, smooth, fine and glossy coat that is dense enough to provide protection. The coat is black, white, and tan, and may be bi-colored or tri-colored. Breeders and Show registries typically prefer the tri-color variation. This breed is a heavy shedder. The Treeing Walker Coonhound has a tendency to be stubborn, but is generally easy to train. Early socialization and obedience training is highly recommended. This breed does not respond to harshness or heavy-handed methods. Training must be done with patience, consistency, firmness, and fairness. They excel in coonhound field trials. This breed is extremely energetic and requires an inordinate amount of exercise. The Treeing Coonhound is not recommended for apartment or city dwelling. They must be in a country setting or a home with a large securely fenced yard to give them ample opportunity to romp and run. They benefit from hunting and working with their master and family play sessions.